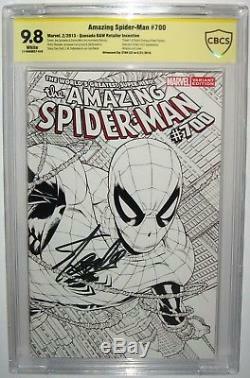 A landmark comic signed by "The Man" himself, Stan Lee. 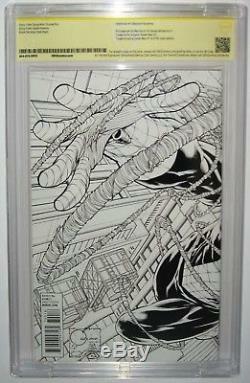 The Amazing Spider-Man #700, ultra-rare Joe Quesada Black and White retailer incentive "sketch" variant, published in 2013, was autographed by Stan Lee in 2016, with the signature witnessed by CBCS, who awarded the comic a grade of 9.8. 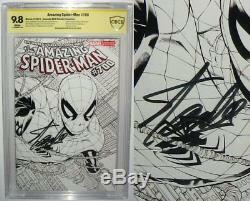 The item "Amazing Spider-Man #700 SIGNED STAN LEE SS CBCSCGC 9.8 Quesada Sketch Variant" is in sale since Thursday, November 15, 2018. This item is in the category "Collectibles\Comics\Modern Age (1992-Now)\Superhero\Spider-Man". The seller is "wonderworldcomicsandtoys" and is located in Lincoln Park, Michigan.